Black cottage is a fully self contained guest accommodation, It is airy and light with its own outdoor living space, making this an ideal home away from home. Black cottage location is shared by an art studio, our main house, a small orchard, the vineyard and gardens. Built in 2011, it has a separate bedroom with ensuite, full kitchen, lounge / dinning that flows onto a private outdoor terrace. It is a sun trap in winter and gets a cooling afternoon sea breeze on hot summers days. As the crow flies, we are 3km from the sea. Just 7 minutes drive to Ocean beach and 12 minutes to Waimarama beach. With golden sands and great surf, these are two of the best beaches in NZ. For wine lovers it is hard to beat Hawkes Bay, there are 70 wineries, many with a cellar door to visit. 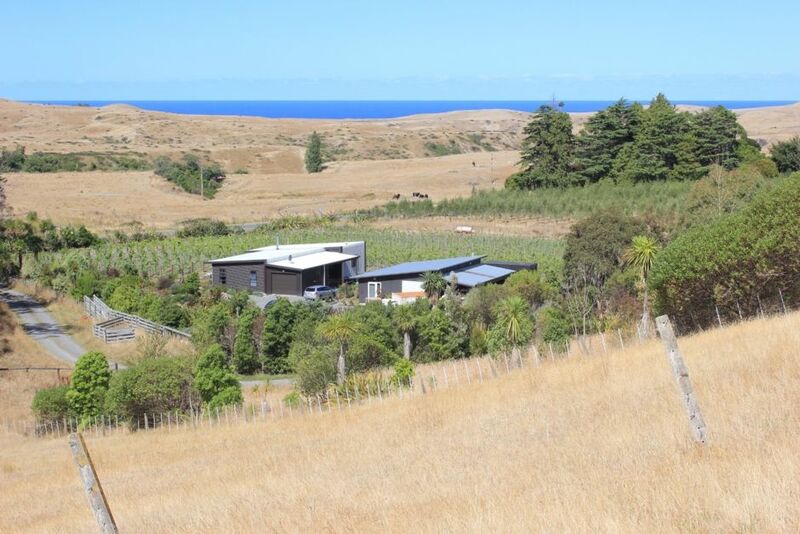 It is 8 minutes drive to the cellar door and restaurant of Craggy Range, 12 minutes to cellar door and restaurant of Black Barn and cellar doors of Te Mata, Red Barrel and Askerne. We are 15 minutes from the fabulous shops, cafes and restaurants of Havelock north, 20 minutes from Hastings and 30 minutes from Napier. Just 12 minutes away from all the Black Barn summer concerts and movie nights, held in their outdoor amphitheatre. Plus they have a Saturday morning market, set amongst the vines, oh la la la la. 45 minutes from the airport. Wood pigeons, pheasants and kingfishers all pop in and 2 herons visit every year for a few months. We have beautiful starry nights, amazing sunsets and incredible clouds and at certain times of the month a big full moon rises from the sea. The drive from home to town is just beautiful, we never get tired of it. An oil heater keeps it toasty in winter plus electric blanket available, hair dryer, towels, and linen are provided, home cinema, new Broil King BBQ, outdoor table, chairs and umbrella. Washing machine available in the main house, just ask. Great water pressure in the shower. Drinking water - rain water with cartridge filter and UV light. Children are welcome but parents must remember that we have a working vineyard, with typical farm hazards, so children must be supervised at all times. Maximum number of guests is 3, plus a porta-cot available for babies. Cleaning is provided, but we ask that you please leave the cottage tidy and dishes done. For stays two nights and more we provide a complimentary bottle of our wine - Maison Noire. Living dining area with table and chairs, couch, coffee table, cushions bookcase, TV, stereo. Herbs, spices, salt & pepper, a range of teas and coffee, cooking oil, olive oil, balsamic vinegar, soy sauce, tomato sauce etc. Glad wrap, baking paper. Full kitchen. microwave, pots and pans, toaster, coffee machine. We had a very relaxing stay at this well equipped cottage in the vineyards. Esther and Guillem were very helpful and friendly hosts who made us very welcome. Lovely beaches nearby. It was a pleasure having Graham and Sally to stay. An interesting couple, I enjoyed or conversations very much. They left our cottage very clean and tidy. Lovely cottage to stay in, very clean , comfortable and it had everything including a complimentary bottle of rose wine from the owners which was very kind and not a drop wasted by us, very delicious! The coffee machine was a nice touch also! Every room was amazing. The kitchen had a serious stove/oven and a dishwasher. The lounge was spacious, had an excellent TV, and many books and DVD movies. The bedroom was light and airy and the bed was very comfortable. The shower in the bathroom was way better than the one in our home. We used the barbecue to cook a meal. The owners were very nice. Just perfect. All this at a very reasonable cost. Esther and Guillem met us on arrival and immediately made us feel welcome - particularly so as shortly after we moved our bags into the cottage when Esther came across and asked us which bottle of wine we would like. A great start. While E & G were only the other side of the screen fence from us we hardly heard them but would pass the time of day if we saw each other. The cottage itself was modern with all modcoms and tastefully decorated with some really fantastic artwork produced by Esther. The property itself was a small vineyard with plenty of vege gardens around the cottage and main home. This area of the Hawkes Bay was lovely with plenty of flat and undulating country with Te Mata Peak being less than 15 minutes away. Havelock North and Hastings too were a short distance by car. It is a wine lovers paradise with 38 wineries open to the public, all within an hours drive. The only drawback is that we never had the opportunity to sample the other wines produced by Guillem as we ran out of time! Great place to stay. Hosts were very friendly and accommodating. Nothing was too much trouble. Had everything we needed for a short break. We thoroughly enjoyed our getaway at The Vineyard Cottage Retreat. Lovely, peaceful, well-equipped cottage with lots of extras such as a garden to top up our salads, home-made jam, a bottle of their yummy wine and fresh eggs. Very friendly hosts. Excellent handy location to swimming beaches and vineyards, including a vineyard with an outdoor summer cinema and Saturday market in the vines. Highly recommend this location to stay. Thanks!